*This is a sponsored post. I was provided with these products for the purpose of writing an honest review. All opinions and ideas are entirely my own. 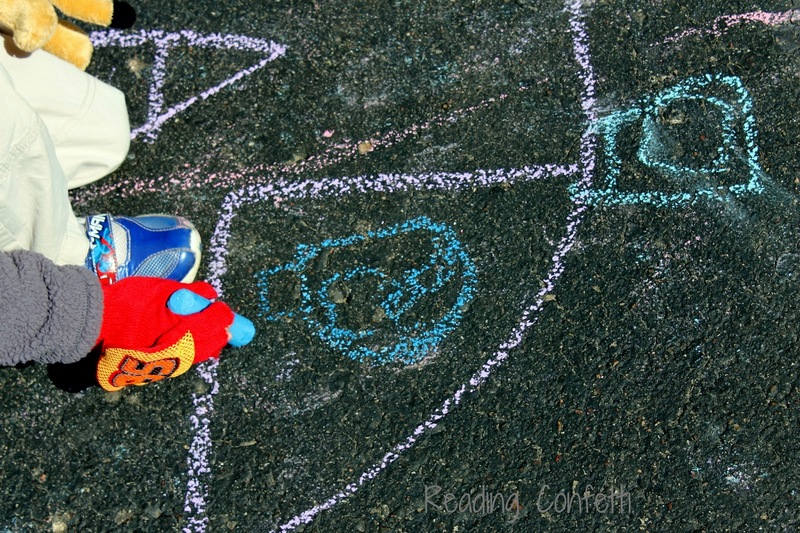 My four year old son is a huge fan of the Octonauts on Disney Junior. They rescue ocean creatures and protect their habitats. His favorite part of the show is the creature report when they share facts about the animal featured in the episode and reveal what it looks like in real life. The Octonauts have little submarines called "Gups". There's the Gup-A, Gup-B, C, D, and E. I decided to take advantage of this to do a little letter practice with the kids. 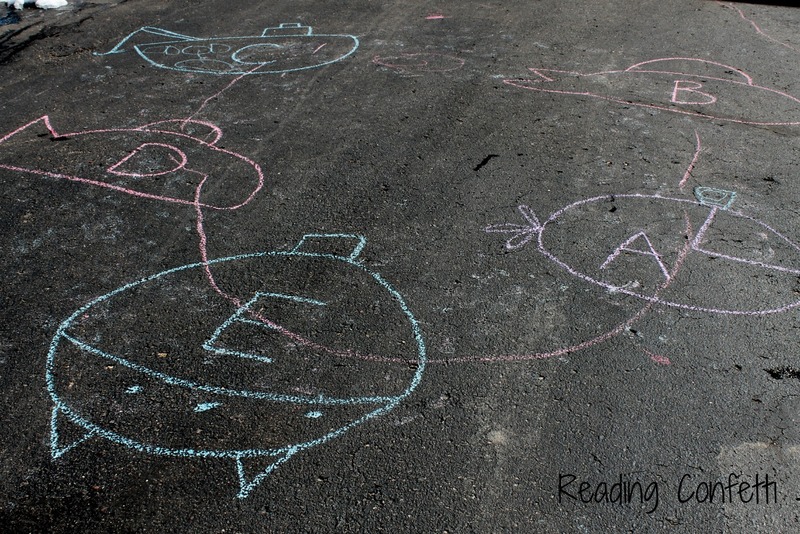 I drew Gup shapes on the driveway with chalk and labeled each with a letter. I designated myself Captain Barnacles and called out "To the Gup-A!" or whatever letter I wanted the kids to stand on. It was lots of fun and I don't think they even realized we were practicing letter recognition. 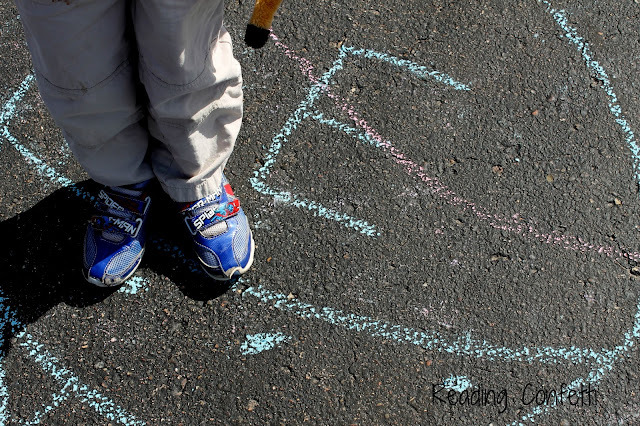 Use beginning letter sounds. For example, you could say "We need to rescue an alligator!" and kids would run to the Gup with the beginning letter sound. To do this indoors, you could make paper cut outs of each Gup and tape them to the floor. He felt my drawings weren't quite detailed enough. 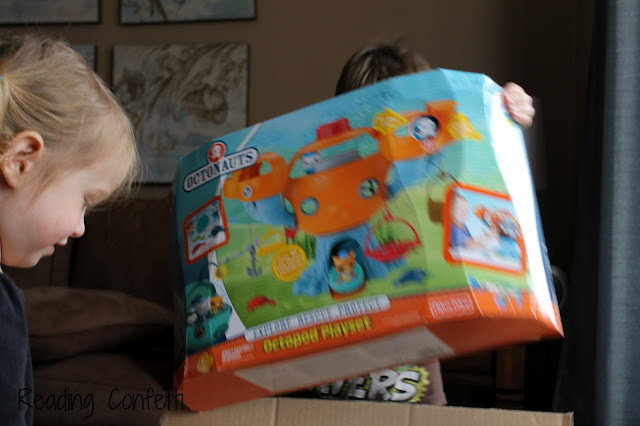 Of course, when I got the opportunity to review some Octonauts toys currently available at Toys "R" Us, I knew my son would be thrilled. It was like Christmas morning when we opened the box. We had the opportunity to play with the Octopod playset, the Gup-C Mission Vehicle, Kwazii & the Slime Eel, and the Octo-compass. 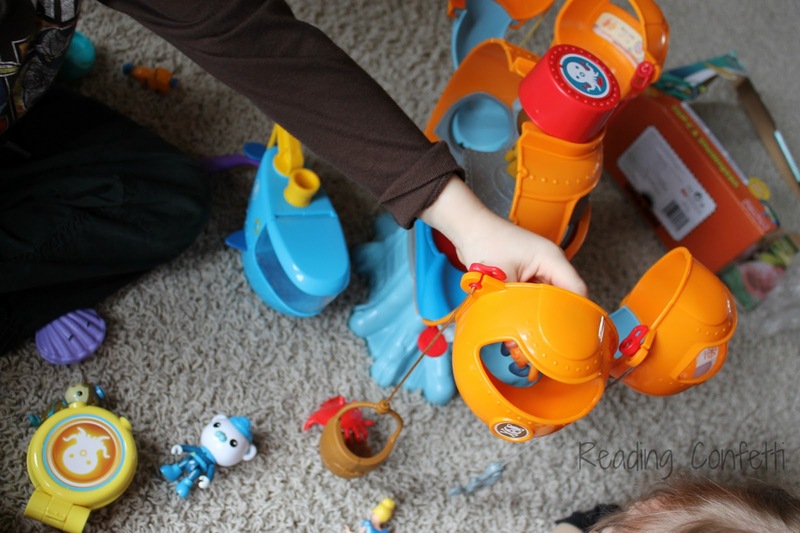 The Octonauts playset would have been exciting enough on its own. 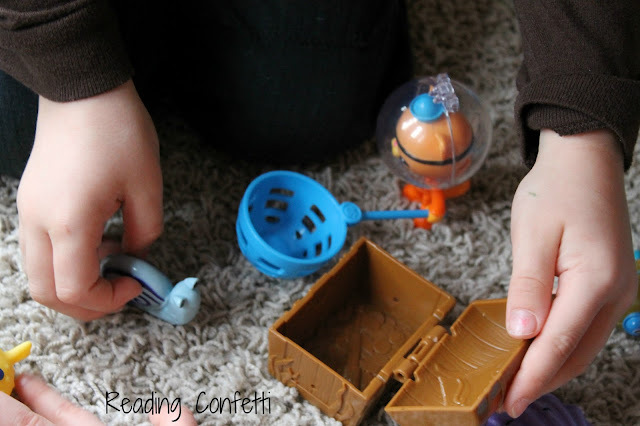 There's over 10 play pieces including Captain Barnacles, Kwazii (who happens to be my son's personal favorite), a mini Gup-A, 3 creatures, 4 rescue tools, and an Octo-alert that features phrases and sounds. This one toy alone provided me with enough time to make dinner completely uninterrupted on the first day we had it! A nice addition to the playset was the Gup C Mission Vehicle & Shellington. 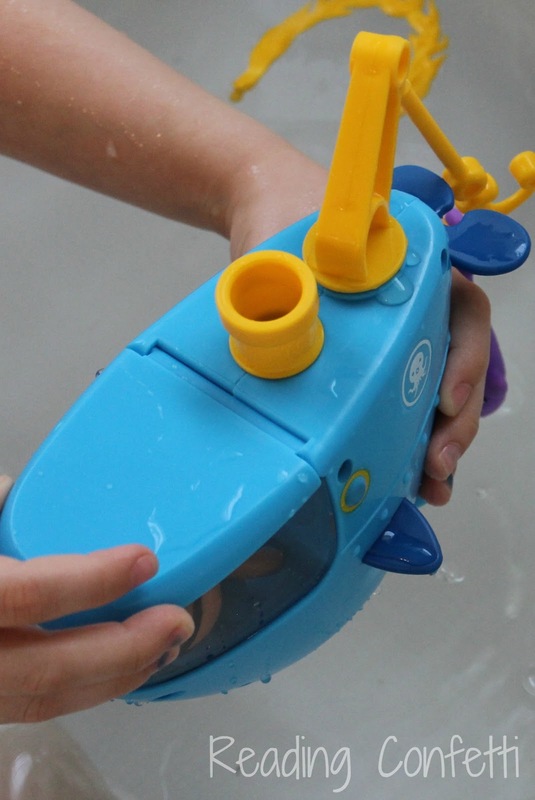 I love that you can take these toys into the bath for even more fun. The color-changing creatures even squirt water. We also had fun in the bath with Kwazii and the Slime Eel set. Our favorite part of this set was the treasure chest that opened underwater. 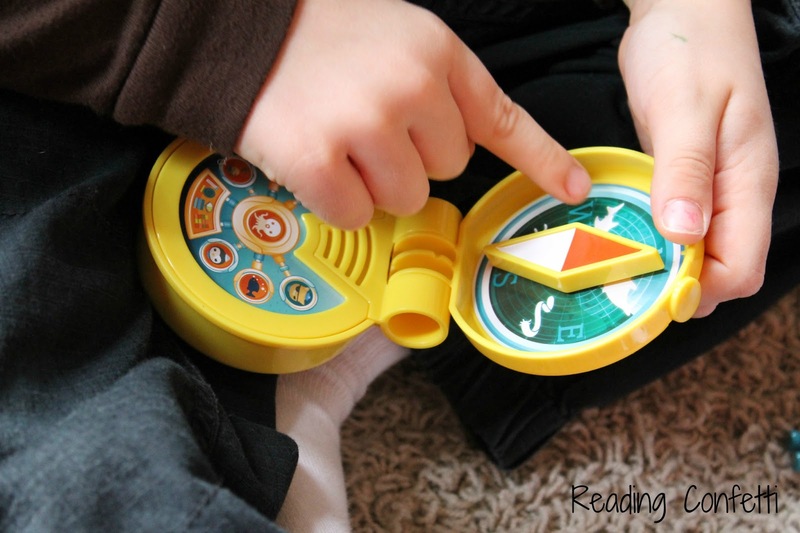 Finally, the Octo-compass is adorable and a great way to introduce cardinal directions. It says lots of fun phrases, makes creature sounds, and has an Octo-alert signal. Do you have an Octonauts fan at your house? Have you ever incorporated favorite characters into a learning activity? I'd love to hear about it. 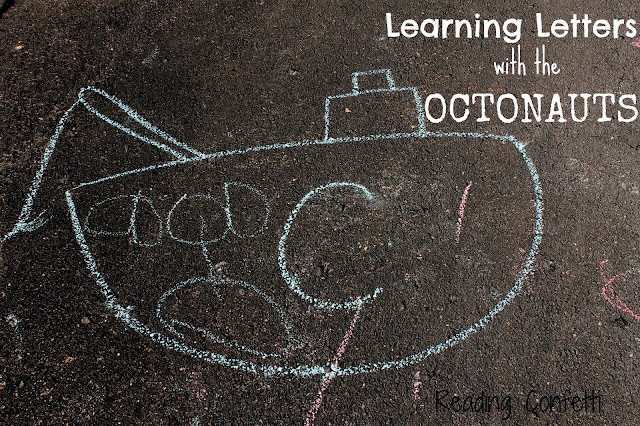 I have 2 five year old Octonaut fans! I had no idea there were toys on the market for this show. The show really gets my kids interested in the real creatures. We've been to the library several times just because of an episode they watched.